Heat oven to 350°F. In medium bowl, stir together cookie mix, butter, egg and 1/2 cup chopped pecans until soft dough forms. Press evenly in ungreased 8-inch square pan. Bake 28 to 33 minutes or until golden brown. Meanwhile, in 1-quart saucepan, heat caramels and milk over low heat, stirring frequently, until melted and smooth. Remove from heat. 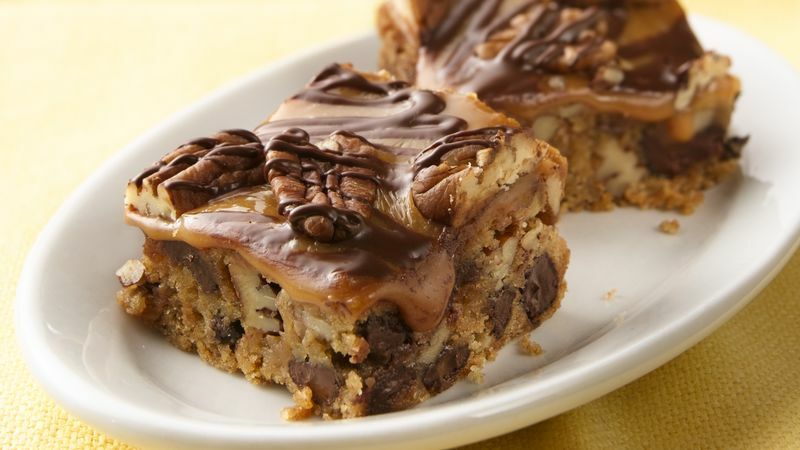 Carefully spread melted caramels evenly over warm bars; sprinkle with pecan halves. Cool completely on cooling rack, about 1 hour. In small microwavable bowl, microwave chocolate chips and shortening uncovered on High 30 to 60 seconds, stirring every 15 seconds, until melted and smooth. Drizzle over bars. Let stand about 30 minutes or until chocolate is set. For bars, cut into 4 rows by 4 rows. To microwave caramels (for step 2), place caramels and milk in 2-cup microwavable measuring cup, microwave uncovered on Medium-High (70%) 2 minutes; stir. Microwave 30 to 60 seconds longer, stirring every 15 seconds, until melted and smooth. Use a wet, sharp knife to cut bars easily. Use your favorite nut for the pecans.